The Pont au Change is on the Right Bank, on the other side of Ile de la Cite from Pont Saint Michel. Actually, these two bridges look alike except that the Pont au Change is longer. Both are three span deck arches, both carry the insignia of Napoleon III, and both were built in 1857. It is called the Pont au Change because money changers had their shops on the bridge during the Middle Ages. 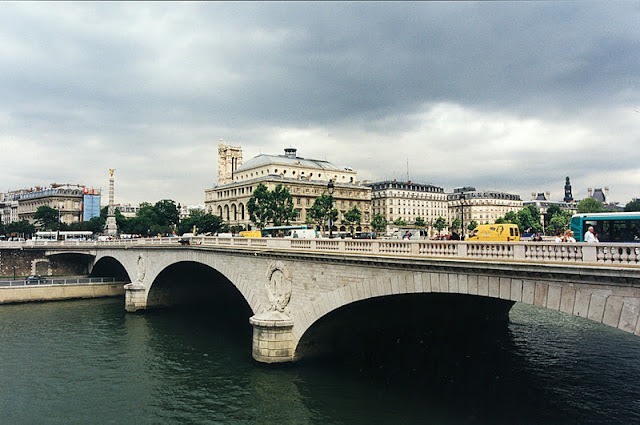 Seine River Bridges: Pont au Change by Mark Yashinsky is licensed under a Creative Commons Attribution-NonCommercial-ShareAlike 3.0 United States License.